Injunctions are scary sounding things, but that’s exactly what they’re meant to be. Fear, rather than actual prosecutions, is the primary means by which injunction orders succeed in shutting down protest. And you can understand why: if a court finds you guilty of breaking an injunction order, you’ll be held in contempt of court which, as Tommy Robinson has just discovered, can result in a custodial sentence. Companies and public institutions that take out an injunction against campaigners typically rely on people’s rational fear of such punishment to dissuade them from continuing to voice their opposition to their activities. But the truth is that despite numerous breaches of the injunctions at sites such as Leith Hill over the last 18 months, there has been neither an attempted nor successful prosecution of an anti-fracking campaigner for contempt of court. In this context, it is worthwhile doing a little bit of myth-busting around the injunctions currently being used by fracking companies. Civil Injunctions: These are the kind of injunctions that are currently being granted to fracking companies. They do not give the police the power to arrest anyone for suspected breach of the injunction. Instead, the company who sought the injunction (‘the claimant’) must notify the courts and provide the details of those they believe to have breached the order. The courts then summon those people to a hearing. So while contempt of court is a criminal offence, suspicion of breaching the order is a non-arrestable. Protection from Harassment Act injunctions (PfHA injunctions): These are more serious injunctions (in terms of their potential consequences) and they do give the police the power to arrest defendants who breach the order, for the offence of Breach of Injunction. We strongly suggest you immediately seek legal advice if you are arrested for breaching a PfHA injunction. 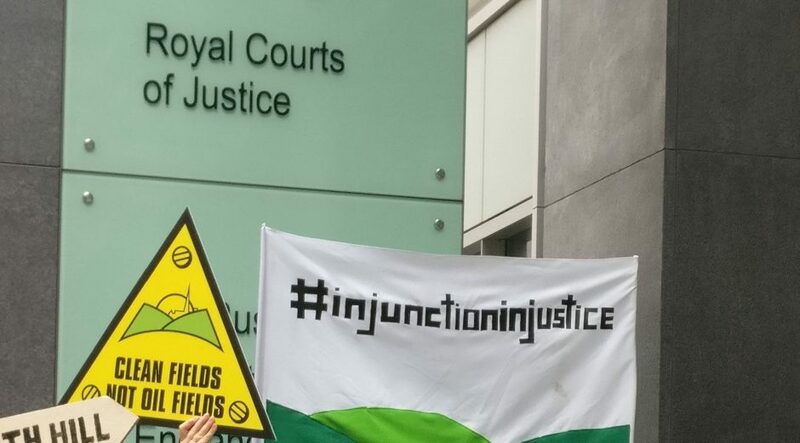 At this moment in time, the courts have not granted any Harassment Act injunctions against anti-fracking protestors. The only injunctions granted by the courts have been civil in nature. 2) It takes a lot of legwork to bring proceedings against someone. In order to prosecute someone for breaching a civil injunction, the claimants need to apply to the court for an ‘Order of Committal’ against those they claim have breached it. To do this, they will need to provide the names (and potentially addresses) of the defendants so that the court can summon them to attend a hearing. Thus, if the claimant cannot accurately identify those individuals which it suspects of having breached the order, it becomes difficult for them to bring a case against them. 3) Even if you do end up in court, it is far from certain you will be found guilty. To be found in breach of a civil injunction, the claimant must prove that the person they’ve had summoned to court not only did – or encouraged someone else to perform – an act that was proscribed by the court order, but also that they did so intentionally, knowing that it was an act prohibited by the injunction. That this person performed or incite an act that was in breach of the terms of the injunction. That they performed or incited the act in full knowledge not only of the existence of an injunction but also the specific actions it prohibits and the area in which they are prohibited. In other words: successfully enforcing injunction orders through contempt of court proceedings can be extremely difficult and time consuming for claimants. What’s more, if you are found guilty of contempt of court it is far from certain that you will go to prison. To return to the case of Tommy Robinson once again: he only received a custodial sentence because he had ignored the orders given to him by the court on previous occasions and was, at the time of his latest arrest, serving a suspended sentence for contempt. 4) Can companies make financial claims against me for breaching the injunction? If a court finds an individual is in breach of the injunction and in contempt of court, it is also possible for a fracking company to then seek both the costs of bringing its case and any damages for the impact activities may have had on its business. They may also attempt to claim that if you are seen to incite others to action then you become financially responsible for the behaviour of others, even if you’ve never met them or have even subsequently urged them not to act. They can claim that your assets will be seized to cover damages and court costs. This is obviously a very frightening prospect. However, so far there has not been an instance where this has happened. To our knowledge, individuals with no assets who are in breach of an injunction have not had a successful claim against them, but this isn’t impossible. It is more likely that a fracking company would have a greater interest in claiming significant damages from individuals they know to have assets worth the expense of further legal action. This does, of course, mean anyone with a mortgage or a business is considerably more vulnerable. It becomes considerably easier for a claimant to prove that someone is in contempt of court if the existence of the injunction and any conditions it does or does not impose are being shared widely, particularly on social media platforms like Facebook. So, while you may think that sharing information about an injunction order will help to protect people, the truth is it may well make them more vulnerable to prosecution and, potentially, conviction. If you’re an anti-fracking campaigner who is currently worried about exercising their right to free speech and assembly, the best thing you can do is to follow the advice given by Corporal Jones in Dad’s Army and DON’T PANIC.